While reading the account about the Centurion and the raising from death the widow’s son at Nain [Luke 7], I lifted up my heart to the Lord Jesus thus: “Lord Jesus, Thou hast the same power now. Thou canst provide me with means for Thy work in my hands. Be pleased to do so.” About half an hour afterwards I received £230 15s [$23,000]. Müller is famous for operating his orphanages while trusting God to provide for every need. What is less well known is that the same faith principle wove like a thread through his entire Christian life. As a result Muller could record many answered prayers. After a vicious childhood and adolescence in which Müller disregarded Christ and even stole tithes, his heart was transformed in 1825 while attending a prayer service (see “Nothing but the blood of Jesus,” p. 13). There he first saw a Christian kneel in prayer, a practice he immediately adopted. It was key to his success. Müller set out to learn God’s will but, untrained in Christian principles, he sometimes blundered. Once he bought a lottery ticket, assuming that if he won, God meant for him to apply to the Berlin Missionary Society. The ticket did win, but the society rejected him. From this he learned not to trust chance methods in God’s work. Another time he wrote a wealthy woman asking for money, but another person answered the letter, sending the sum requested but urging Müller to seek deeper Christian faithfulness. He took the advice to heart and learned to go to Christ for forgiveness when he slipped back into drunkenness, lies, and other sins. And he found power through prayer to quit his most besetting vices altogether. Increasingly as Müller learned God’s reliability, prayer became his standard operating procedure. Cut off from his father’s financial support, he asked the Lord to provide a substitute income. The Lord did provide, in the form of a tutorial job that enabled him to complete his education. Soon the London Society for Promoting Christianity among the Jews (LSPCJ), learning Müller was eager to work with Jews, invited him to come to England. However he could not accept because the law required him to serve a term in the army. In answer to prayer, the Prussian army waived his obligatory military service, freeing him to go to London. His reliance on God further increased when he left the relative security of employment with the LSPCJ in 1830, a step he took because he felt obliged to work under God’s direction, not according to human assignment. Before asking Mary Groves to become his wife, Müller spent long hours in prayer, seeking inner assurance that she was the Lord’s choice for him. The pair married simply, without lavish expense. In Müller’s first independent pastorate at Teignmouth, he took two more “toddler” steps of faith. Determined not to be merely a hireling in God’s work, with Mary’s consent, he refused a set salary and relied on freewill offerings. To his surprise he received more than his old salary. This stimulated him to give more for others’ needs and to Christian ministries. He also refused to be bound by a set term of ministry, choosing to move whenever God prompted him. As it turned out, this was providential. In 1832 God led him to Bristol where he would accomplish his great life work. In Bristol in 1834 (about a year and a half before the orphanage plan), George Müller and a likeminded co-worker, Henry Craik, made their first big faith venture. For months they had wanted to increase the distribution of Bibles and aid missionaries and Christian schools. After much prayer they brought the matter before other believers and formed The Scriptural Knowledge Institution for Home and Abroad (SKI). Other ministries conducted similar projects, but Müller and Craik observed that these ministries did not operate by biblical standards. Although at times we have been brought low in funds, the Lord has never allowed us to stop the work. . . . The number of children that have been provided with schooling in the day schools amounts to 439. The number of copies of the Holy Scriptures which have been circulated is 795 Bibles and 753 New Testaments. We have also sent aid to missionary labors in Canada, the East Indies, and on the continent of Europe. Müller would continue such reports to the end of his life with ever-increasing numbers, and he always faithfully accounted for every penny donated to the work. Money given for one purpose was never diverted to another. Today it has been impressed on my heart no longer merely to think about establishing an orphan house but actually to begin making plans. I spent much time in prayer to find the Lord’s will in this situation. Convinced God was in it, he announced his plan publicly, taking care not to play on emotions. One of the first gifts was a single shilling. The Lord sent other small monetary gifts, supplies, furniture, a house, and helpers. Soon the first orphanage was open. I felt that I needed more exercise, being very cold; wherefore I went not the nearest way home. . . About twenty yards from my house, I met a brother who walked back with me, and after a little conversation gave me . . . £5 for the Orphans . . . . Had I now been one half minute later, I should have missed him. But the Lord knew our need. . . . I had no human prospect whatever of getting even 100 pence—much less £100. In addition to this, today was Monday when generally the income is little. But in walking to the Orphan House this morning, and praying as I went, I particularly told the Lord in prayer. . . . And thus it was, I received this morning £301 [$31,000] for the Lord’s service. . . . I walked up and down in my room for a long time, tears of joy and gratitude to the Lord raining plentifully over my cheeks, praising and magnifying the Lord for his goodness, and surrendering myself afresh, with all my heart, to him for his blessed service. Müller’s testimonies may lead us to assume that he was a man with the gift of faith. He did not think so, and therefore often lacked confidence. Consequently he ransacked the Bible for promises and prayed them back to God. One of the Scriptures he often claimed was God’s promise to be a father to the fatherless (Psalm 68:5). His usefulness came, he knew, from communion with the Lord. He said that had he not trusted God, he would have cracked under the constant strain of meeting the orphans’ needs. Müller learned to pray about everything: travel, bread, soap, illnesses, sermons, souls—and health. For instance, during an outbreak of measles in 1866, he prayed that the number of children sick at a given time would not overwhelm the infirmary, that none of the children would die, and that none would suffer permanent aftereffects. Although about 300 children became ill, Müller’s three requests were answered. In answer to other fervent prayers, Müller also witnessed revivals in the orphan houses in 1857 and 1872. Near the end of his life, Müller calculated 50,000 distinct answers to prayer—almost two a day after his conversion in 1825. When he didn’t pray, he failed. Instead of taking time to pray before one trip—despite knowing he should—he chatted with believers until it was time to leave. Consequently he found himself unable to speak to anyone in the coach about Christ or even to pass out tracts, as was his custom. When Müller did pray, he frequently testified that God answered in marvelous ways. In December 1857 a boiler in one orphanage began to leak. It had to be repaired, but during the work there would be no heat and the small children would suffer. A day was set for repairs. Then a bleak north wind set in. 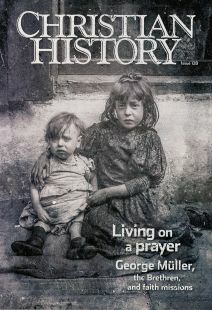 Dan Graves is the layout editor for Christian History and writes CHI’s “This Day in Christian History” feature.